The BattleHorse template was used as a base for the New Day template. Aside from the visual makeover, additions are a configurable topmenu and some compatibility fixes for more recent DokuWiki versions. Original development was done by Louis Wolf (Chirripó) louiswolf [at] chirripo [dot] nl. Hannes Dorn hannes [at] dorn [dot] cc added small changes to CSS files. Get the template directly from Github. The following text regarding the sidebar was copied from the Battlehorse template page. Every namespace can have its own sidebar which can be used to create a namespace specific menu. Simply add a page called sidebar. If no sidebar is found in the current namespace, the sidebar of the parent namespace will be used. 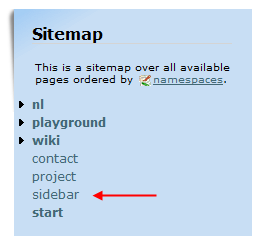 If there is no sidebar page in the namespace hierarchy, the index will be used. In order to use the sidebar you just have to create a page named sidebar for every namespace you want a menu into. Then use normal wiki markup when writing the contents of that page ( use headings, links and so on ). If a given namespace does not have a sidebar , the sidebar of the parent namespace will be used and so on recursively until the root namespace is reached. If no sidebar is found even there, then the wiki index will be used. Now the start page will use the sidebar page as its menu. page1 ,page2 and page3 will use the wiki:sidebar page as their menu ( page3 will inherit it from the above namespace, since no sidebar is defined for wiki:other ) . The following text regarding the topmenu was copied from the Simple template page. The template uses the CSS hover technique to generate the topbar menu from a normal wiki page which contains unordered lists of links. Therefore you have to create a page called “topbar” in your DokuWiki root namespace. Edit it and insert an unordered list of links per menu item. Don't insert anything else than these lists in this page as it will lead to garbage . At the moment only lists with up to 4 levels are supported. You can also have a separate topbar for each namespace. For example, if you browse to wiki:syntax and the page wiki:topbar exists it will be used as the topbar. The space between those lists is important! To define a new action, edit tpl_actions.php in the template folder. Add your actions below for others to enjoy. When doing so, please disable your actions ('enabled' ⇒ 0). Downloading the file below is NOT enough to get a link with an image. You'll still need to add an 18×18 gif icon for each action, named after the action value name (so 'action' ⇒ 'digg' needs a digg.gif image). Put your icons in /YOUR/TEMPLATE/DIRECTORY/images/p/actions/. Note) The template author is willing to create a downloadable icon archive, just send him your icons by e-mail. Alternatively people could externally link their icons here. * Define your actions here. *	Action name. Also the name of the associated gif image. *	%PAGEURL% will be substituted for the wiki page url. *      %PAGETITLE% will be substituted for the wiki page title. *	The link text that will show up in your wiki action menu. *	Turn off actions by setting this to something other then 1 (suggested: 0). This solution introduces new issues (content pops below the sidebar), even on larger screens. Ever considered to look closer at http://wiki.hedus.fr/? He fixed the problem with small windows. Maybe you take his solution…? A new topmenu which was taken from the Simple template topmenu. The topmenu is now based on a wiki page and supports submenus. New actions for Facebook, Twitter and StumbleUpon. Also it's easier to add your own actions. Please share your own actions here. The sidebar now has the option to be shown separate from the other wiki actions. Fixed lower right border image. Again. Is there a way to make the searchbox a little bigger ? Is there a way to make the searchbox a little bigger ? What is the file CSS (it's name)? The line doesn't exist yet. Just add it to layout.css. Is there a way to fix the width of the sidebar? How and where to remove the text “This is an index over all available pages ordered by namespaces” from the sidebar ( image: http://s16.radikal.ru/i190/1006/95/a80de2743c99.png )? Read the documentation. You didn't create a wiki page called sidebar. another configuration option in the template (people find it hard enough to configure as it is). However, I could fix this for your situation if you really need this. Just let me know by mail. ….But I think it's very un-wiki like…. Could I have details of how to do this too please. Above do you mean that the way it's done in dokubook is easy to do in newday as well? If so I'm happy to go and look at dokubook to see how it's done. How can I add the namespace subscription functionality and rss feed subscription functionality to this template? This is not template functionality, but Dokuwiki functionality. You should look into the Dokuwiki documentation. I would like to have the JS exandable indexmenu tree in the sidebar. But it will not work. No JS tree in the sidebar only textversion. Calling the page sidebar directly works perfectly. The problem is not there when I revalidate using the default template.